Heels are cute and all, but sometimes, you just have to give your feet a rest and slip into a comfy pair of flats. 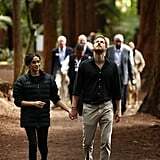 No one knows this better than Meghan Markle, who just wrapped up a whirlwind tour that spanned 16 days and featured more outfit changes than we can even comprehend. 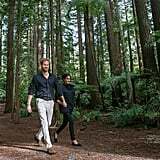 Early on in her travels with Prince Harry, the mum-to-be made us scream "hell yes!" 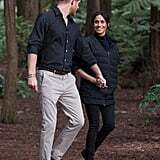 when she wore the same pair of $145 Rothy's flats not once, but twice in the span of two days, so it was only fitting that she opted for sensible shoes yet again on the final day of her tour. 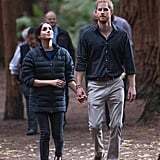 While visiting the Redwoods Tree Walk in New Zealand, the Duchess of Sussex changed out of the pleated skirt and Manolo Blahnik suede pumps she wore earlier in the day in favour of Prince Harry's puffer jacket (aww! 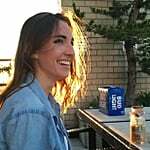 ), black skinny jeans, and practical flats from San Francisco-based brand Birdies. 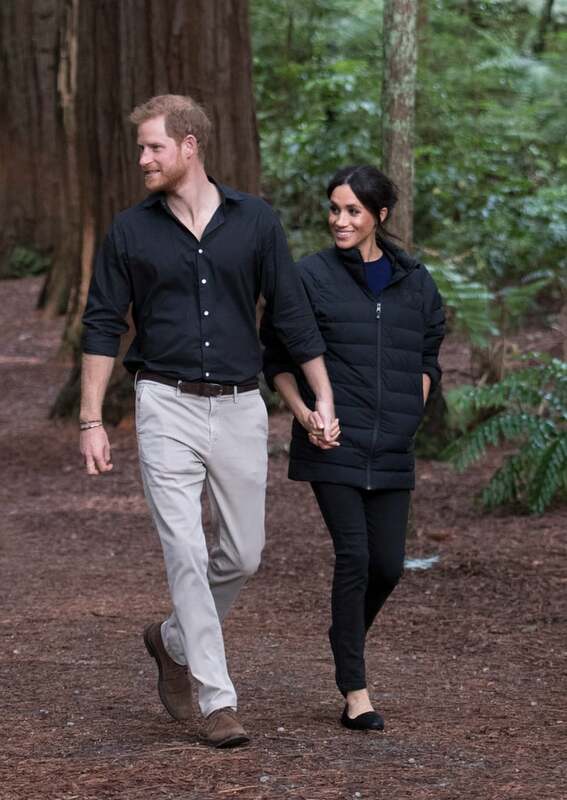 The footwear company refers to its shoes as "the stylish flat that's secretly a slipper," so no wonder Meghan saved them for the last leg of her endless journey. Her classic black flats have quilted insoles and quite the reasonable price tag, ringing up at just $120. Plus, they're still in stock online — score! 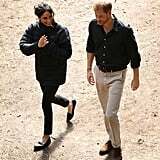 Ahead, admire Meghan's sensible footwear, and keep reading to shop her exact flats and other similarly comfortable styles.